With its detailed control parameters it takes a while to learn but it's worth it. Great sounding strings. Lots of beautifully recorded articulations. Incredibly sophisticated control parameters for maximum playability. Audiobro Remote Control enabling multiple control of individual instruments. You'll need a powerful system. Audiobro established itself as a major player in the string library market with the quality of LASS version 1. But with version 2 and now 2.5 it's added layers of control which allow the user to put together sophisticated arrangements more easily. "Here you will find pretty much every articulation in the string player's repertoire"
Firstly a word about the quality of the sample library. Here you will find pretty much every articulation in the string player's repertoire. From legato with and without vibrato to marcato, staccato, pizzicato and many more. It's also possible to have a full sordino library in addition, a muted style much used in film scores. The samples are all made using multiple players to avoid the dreaded 'same player' problem and all short sounds like staccato have multiple round robin sets to prevent the 'machine gun' effect in fast repetitive phrases. Legato patches can be set up with slides between notes (glissandi) and the short patches also have multiple dynamic levels. All in all, this is an excellent library, which as you will see has been devised for maximum control and realism. If your samples are made section by section (first violins, seconds, violas, celli and bassi) then so long as you play single notes for each section you always have the same number of players. But what if you decide to have each section play a two-note harmony? Suddenly you have doubled the number of players. As you increase harmonic density so the size of your orchestra increases at the same speed that reality decreases. What Audiobro has done is split every section into four. You get first chair (a solo instrument) and then sub sections called A, B and C. By using the auto arrange script (switchable on each individual instrument patch) you can then put all the instruments in a section onto the same MIDI channel and give it some rules, such as in three-note harmony the highest note is played by first chair and section A, second note B and lowest C.
Then if you play a single note line you get everyone playing together, but as soon as you play harmony it splits the sample sets up according to the defined rules and you get something that sounds incredibly close to the real thing. This is called divisi and is a major part of why string orchestras sound the way they do. If the second violins play a three-part chord while the firsts all play a melodic line, the chord will have a different sound as you have less players on each note. The fact that you can play that on one MIDI channel means ideas can be played directly and that really increases both workflow and creativity. One of the most time-consuming tasks in string programming is rhythm. As well as having the same divisi possibilities in every non-legato patch (such as staccato) you can also use the A.R.T. script to simplify the playing of rhythmic passages. All you do is call up a preset script, or program your own, and then hold down the sustain pedal and hold the note or notes. Tempo comes straight from the DAW and off you go. "It's easy to create rhythmic passages that would take ages to play and program"
The script has a step sequencer feel to it and you can adjust velocity and time signature. It's easy to create rhythmic passages that would take ages to play and program and the round robin samples mean that even with fast repeated notes it sounds natural and realistic. Coming off the sustain pedal stops the script so it is possible to just play and bring it in and out as needed. Because it works in conjunction with auto arrange it's easy to create accented chords followed by rhythmic pulses which split in and out of harmony. Great stuff. Stage and colour is a clever script that in conjunction with the A.R.C. (Audiobro Remote Control) allows you to set the stage position, width, EQ and reverb colour of every individual divisi section. This gives added depth to your sampled orchestra by positioning the players accurately as they would be on the soundstage and there are presets which emulate classic film scores to get you started. Beyond that there are other scripts which give you the ability to microtune different instruments for some really discordant film effects and individual EQ sections for each patch which can be controlled by the A.R.C. should you so wish. Ultimately we can only give you a brief overview of what you can do with LASS as it is a huge instrument. For almost every control option there is an associated MIDI CC number. So, for example, if you want to detune using the microtunings but only want it on certain passages you can bring it in and out, you can decide when a legato goes from non-vibrato to vibrato. In the A.R.T. scripts you can alter the way the next note re-triggers and switch patterns on the fly, all in real time and all programmable. Couple that with the A.R.C. and you have a massively powerful control system, which puts all the creative elements in your hands. If there is one caveat it is that you need a powerful system to run it and as much RAM as you can afford. While you can get away with 4 or 8GB we would say that 16GB is best, so you will also have to be running 64-bit. 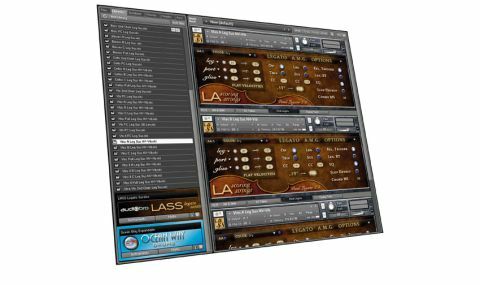 That said LASS 2.5 is a fabulous creative tool and will provide you with a much simpler path to great sounding realistic string parts.